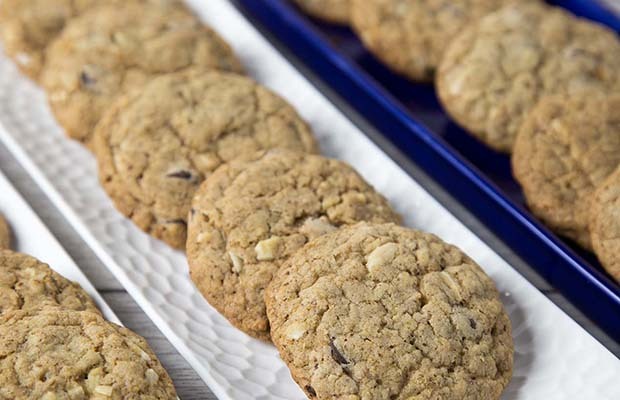 Cookies are a great way to incorporate flax into your diet! In a large bowl, cream together butter and sugars until light and fluffy. Add eggs and vanilla and beat well. In another bowl, mix together flour, oatmeal, milled flaxseed, salt, baking powder, baking soda. Stir into creamed mixture. Add almonds and chocolate chips if desired. Mix until blended. Form dough into 1 inch (3 cm) balls. Place on an ungreased cookies sheet, leaving about 5 cm (2 inches) between cookies. Bake at 350 ºF (180 ºC) for about 10 minutes or until golden brown. Serving Size: 1 cookie. Each serving contains 3/4 tsp (4 mL) of flax.